Rao holds the Ericsson Endowed Chair in Wireless Access Networks in the Jacobs School of Engineering, funded through Calit2. University of California San Diego professor Bhaskar Rao will receive the 2016 Technical Achievement Award this week from the IEEE Signal Processing Society (SPS). The formal ceremony takes place in New Orleans during the 42nd IEEE International Conference on Acoustics, Speech and Signal Processing (ICASSP 2017). Rao is a professor of Electrical and Computer Engineering (ECE) in UC San Diego’s Jacobs School of Engineering, and a longtime participant in Calit2’s Qualcomm Institute. In announcing the award, the society cited Rao’s “fundamental contributions to array processing and sparsity-based signal processing.” The award is one of the society’s most prestigious honors. 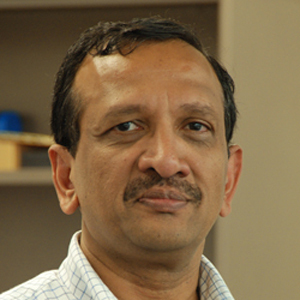 While Rao was elected an IEEE Fellow for his work on the statistical analysis of subspace algorithms for harmonic retrieval, for the past two decades he has been a pioneer in the area of sparsity and its role in signal processing. 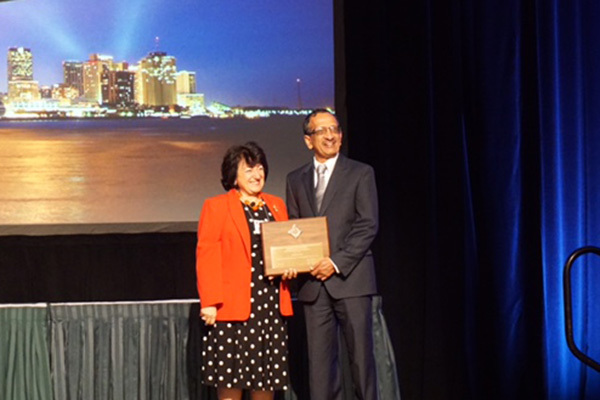 UC San Diego electrical engineering professor Bhaskar Rao accepts his Technical Achievement Award from the IEEE Signal Processing Society in New Orleans March 6. Rao began developing novel measures and algorithms for sparse modeling. In a landmark paper* from 1997, his student Irina F. Gorodnitsky and he developed FOCUSS, a re-weighted l2 norm minimization algorithm for sparse signal reconstruction from limited data. UC Rao introduced grad student Ritwik Giri for final defense of his Ph.D. dissertation in late 2016. His student David P. Wipf and Rao also developed a leading algorithm for sparse signal recovery based on sparse Bayesian learning that remains in widespread use today. “That paper**** in 2004 and follow-up work in 2007 with Wipf and 2011 with Zhilin Zhang represent a seminal contribution to algorithmic work,” said ECE professor and chair Truong Nguyen. Multimodal Sparse Bayesian Dictionary Learning Applied to Multimodal Data Classification, co-authored with Igor Fedorov and CSE Prof. Truong Q. Nguyen. First-author ECE Ph.D. student Fedorov (who expects to complete his doctorate in 2017) is a member of Rao’s Digital Signal Processing Lab as well as Nguyen’s Video Processing Lab. The paper is part of the machine learning for signal processing track. Sparsity Regularized Principal Component Pursuit, co-authored with ECE Prof. Pamela Cosman and her Ph.D. student, Jing Liu. The paper is scheduled during the conference’s signal processing theory and methods track. Multivariate Scale Mixtures for Joint Sparse Regularization in Multi-Task Learning, joint with Ritwik Giri, in the track on machine learning for signal processing. 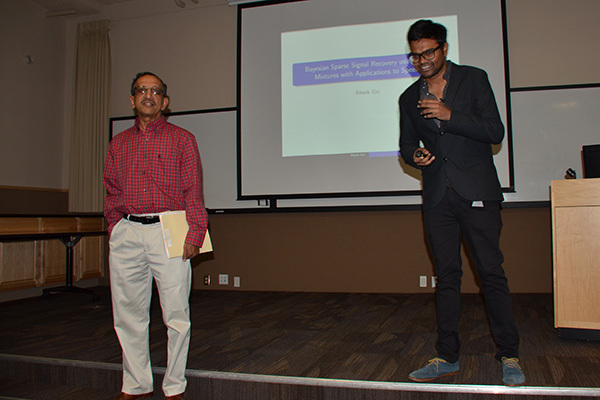 ECE alumnus Giri(Ph.D. ’16) graduated with a dissertation on Bayesian sparse signal recovery. Immediately after receiving his Ph.D. in electrical engineering from the University of Southern California in 1983, Rao joined the ECE faculty as an assistant professor in the Jacobs School of Engineering. In 1989 he joined the ECE faculty as an assistant professor. He advanced to full professor in 1995. Since 2008, Rao has held the Ericsson Endowed Chair in Wireless Access Networks. He is also an active participant in the Center for Wireless Communications (and its director from 2008 to 2011), as well as the California Institute for Telecommunications and Information Technology (Calit2) and its UC San Diego division, the Qualcomm Institute.